This is our overview article about the Family Winemakers Tasting 2017 event. We’ve attended and reviewed these event organizers a few times in the past (most notably in Pomona). On August 20 we tasted pinots from 18 wineries. And there are two great messages. Out of those 18 wineries, only one produced a flawed wine. After about two hours, Norma figured out what was happening: Family Winemakers 2017 stay true to your terroir. Terroir matters, especially for pinot noir. If you have Santa Lucia Highlands grapes, make Santa Lucia Highlands wine. If the fruit is from Santa Rita Hills, the wine should have the dry, desert characteristics of that AVA. Pinot noir once was a grape that was difficult to vinify. No more. Between chemistry, technology, and accumulated knowledge, producing a competent pinot noir has become the new standard. Stay true to your terroir means when you are confronted with a load of pinot noir grapes from the Santa Rita Hills, do not try to turn it into Russian River Valley wine. On August 20 we made our way to San Francisco for the Family Winemakers 2017 tasting. We’ve avoided this event in recent years because it had been held at Ft. Mason, a location virtually inaccessible from anywhere on the peninsula. For 2017 the event moved to Pier 27 on the Embarcadero. We decided to take a chance. And we were not disappointed. We visited fourteen wineries pouring pinot noir. These were the wineries new to us. Four old favorites continue their excellent work. We’ll say a bit more about the pluses and minuses of the venue at the end of this summary. Between the folks at U.C. Davis, Fresno State, and Cal Poly San Luis Obispo, pinot noir grapes have been tamed. Of the 14 wineries, 13 had wine that ranged from excellent to pretty good. Only one pinot we tasted had serious flaws. More important, we tasted a total of 17 pinots from those wineries. One single bottle was bad. Ten years ago this would have been remarkable. Between the folks at U.C. Davis, Fresno State, and Cal Poly San Luis Obispo, pinot noir grapes have been tamed. 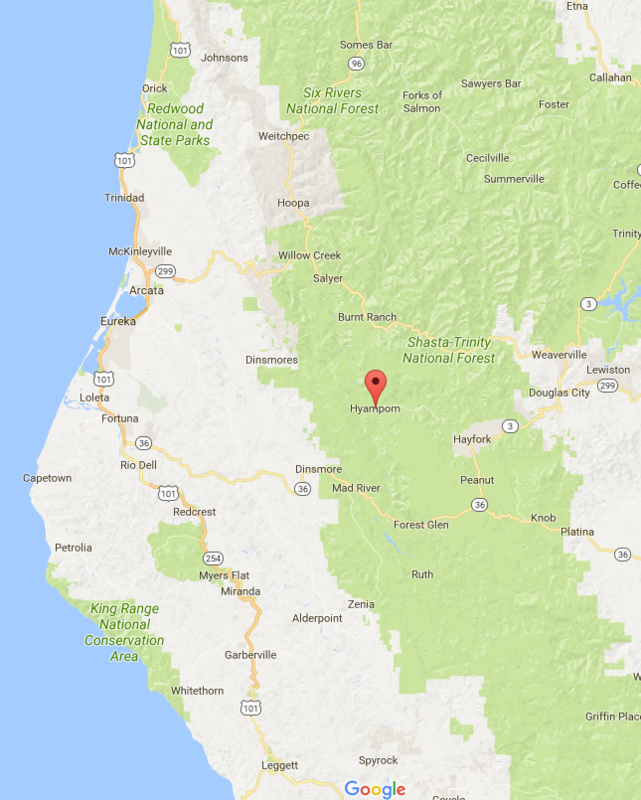 A complete list of the new wineries at Family Winemakers 2017 follows along with links to their websites. But we have to note some, um, unusual outfits. 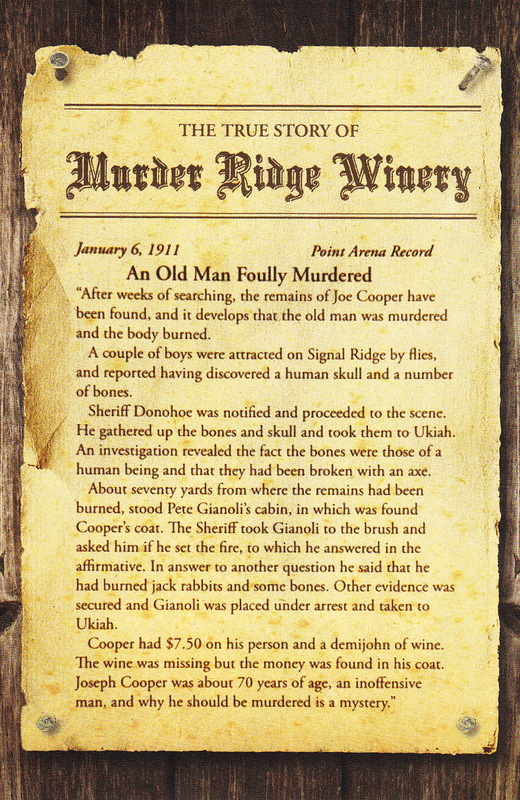 Most original name: Murder Ridge, located on a ridge where there was actually a murder in 1911. Region rising, Lodi: Dancing Coyote (Clarksburg) and Cabana (East Sacramento) in a tie. By the way, several wines used Lodi pinot grapes. As you might guess they are dense, rich, and add notes of chocolate and cola to the finished product. Migrated furthest to make wine: Close call. Parmeson’s Tom Parmeson is from Houston. But by about 400 miles the winner is Patrick Krutz of Krutz Family Cellars who hails from Mississippi. 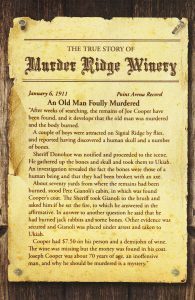 We suspect the eventual winner might be Michael Wettle of Owl Ridge Wine Services, but we’re waiting for confirmation of his origins. Biggest disappointment: Mantra Wines sells out their pinot every year and had none available for tasting. It must be yummy! Best pedigree: WesMar Winery co-owner Denise Selyem is from the justifiably famous Williams & Selyem Winery. Here’s the complete list in roughly the order we tasted them. 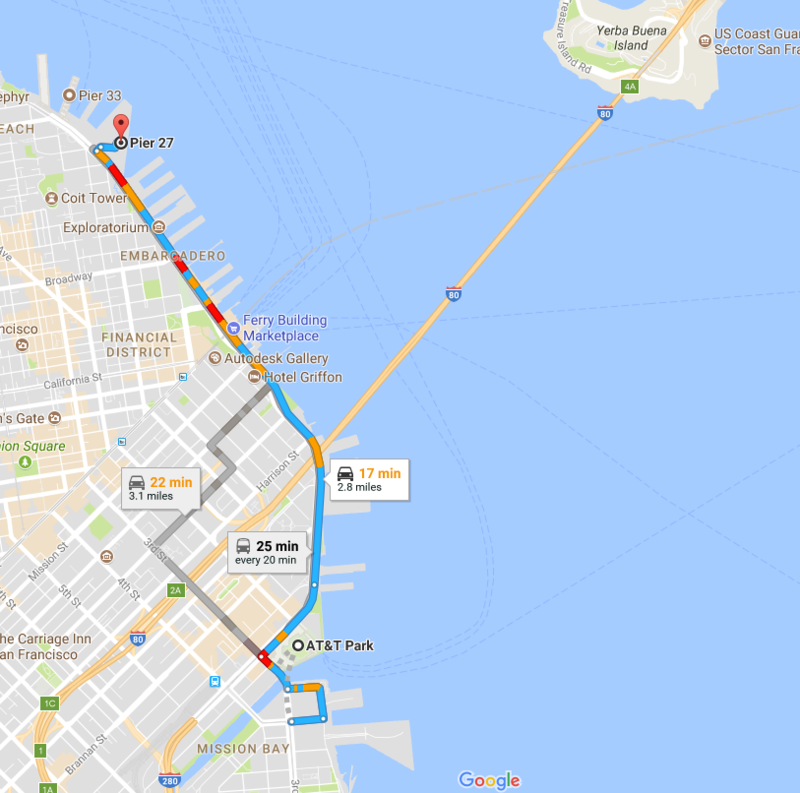 The Pier 27 venue is on The Embarcadero about halfway between the Bay Bridge and Pier 39. (I know that doesn’t seem to make sense, but the pier numbering is idiosyncratic even by San Francisco standards.) 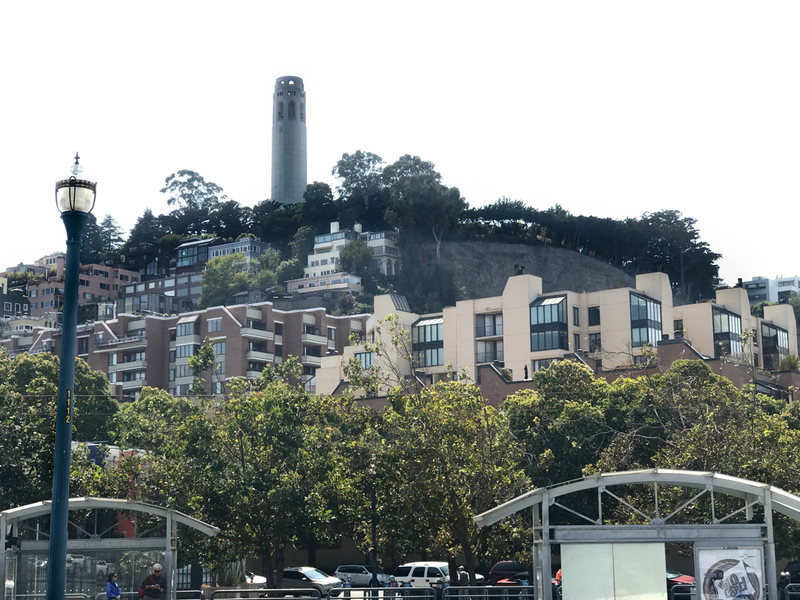 This is a brand new modern building with great 180° views from the Bay Bridge to Coit Tower. Our only complaint is parking. The “official” Pier 27 parking lot has space for maybe 100 cars. Howeer, there is a huge concrete plaza that could have easily doubled the available space. That lot was full when we arrived at 11:30 am. We found a garage almost next door at Pier 31½ where we paid $30 to park indoors. Better all around. 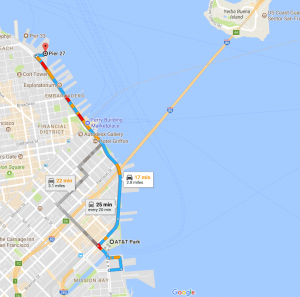 Pier 27 is 2.8 miles north of AT&T Park where the Giants play. Much to our amazement, some fans parked on the street way north of the Bay Bridge and hiked down to the game. Street parking has a price of zero on Sundays. The game’s first pitch was scheduled for 1:05. Luckily the number of fans dwindled as we neared our destination. A day well spent. 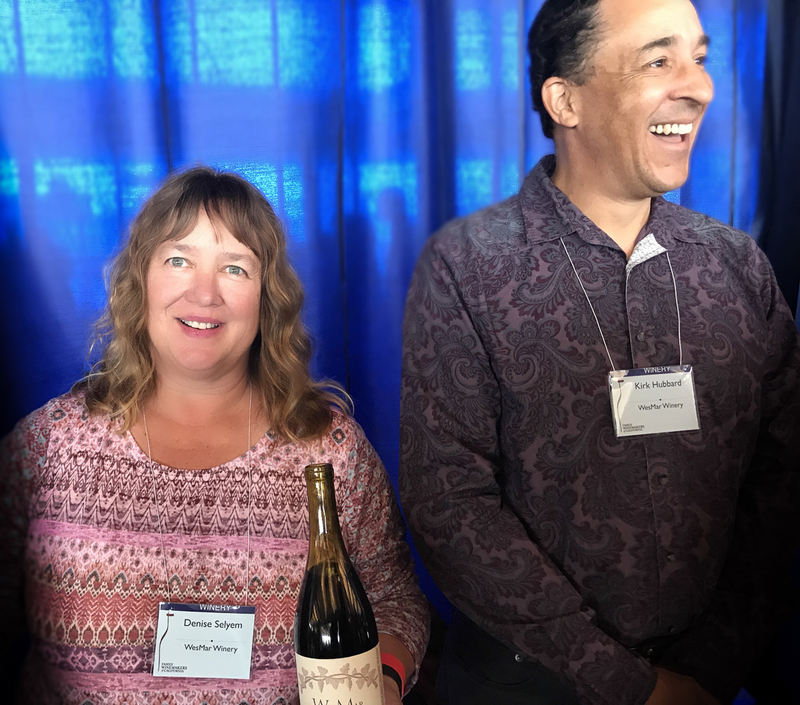 We’ll post in-depth reviews of the fourteen pinot producing wineries new to us at Family Winemakers 2017 as time and energy permit.